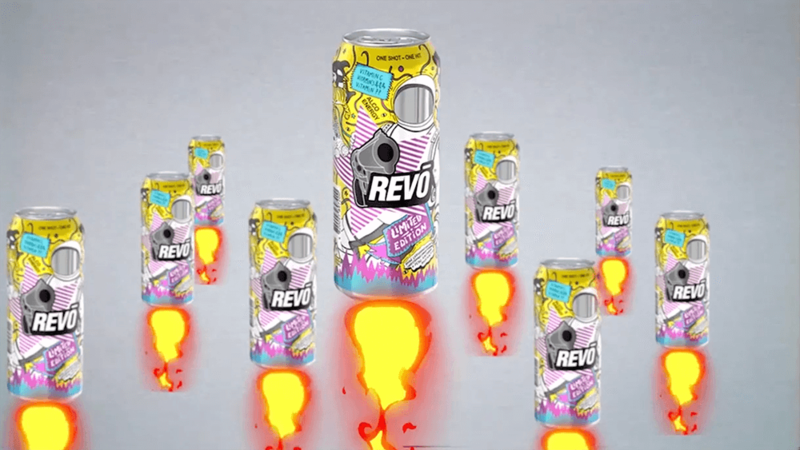 Thanks to an original concept created and implemented jointly by ODDEE Agency and New Products Group, Revo Energy™ managed not only to increase sales but also to significantly rejuvenate the brand, attracting a new influx of fans. Over the 11 years of its existence on the Ukrainian market, REVO™ has rightfully earned the status of a “legendary energy drink”. A drink with character, the motto of which is “One shot – one hit”, has repeatedly proven its originality, preparedness for unexpected challenges and unpredictability in the best sense of the word. In June 2018, New Products Group released a limited version of the drink. The collector’s pop-art can depicts the Cosmonaut, the hero of the most award-winning REVO™ TV commercial, which won numerous awards at advertising and creative festivals. As part of the project, Oddee Agency and New Products Group acted in the spirit of modern youth trends. They made an Insta-series, the main characters of which are an explosive pair: a shy Cosmonaut and his witty, daring and absolutely “off his rocker” friend the REVO Can. The series consisted of 9 one-minute episodes and was posted on the Youtube channel and on Instagram. The “fantastic multi-energy blockbuster” garnered intensive fan activity on Instagram and Telegram; among other things, the fans themselves created Telegram stickers based on the series. In three months, both the Instagram and YouTube channels received about 40 thousand subscribers, and the series itself collected more than a million views. Later, on the basis of the series, a paperback comic book was released, which the Cosmonaut personally promoted at Comic Con Ukraine (his stories about the event gathered more than 180 thousand organic views). REVO™ sales increased by more than a third during this time. “The first scripts were perfectly “polished” and when the project was already launched, we decided to radically change everything. We brainstormed and edited before each new episode. We decided to approach the project as if it was our own mini-startup. If we made Revo purely for the brand, it would not be as audacious and would be more distant from the public”, – comments Alina Tsyganok, creative director of Oddee agency. “The Insta-series about the adventures of the Cosmonaut and the REVO Can is an example of effective cultural branding, which doesn’t inform the consumers about practical advantages of the product, but connects with their emotions. This is a kind of “formula of love”, which we have calculated and hit a bull’s eye, having immediately received both an influx of fans and their sincere loyalty, – notes Elena Selutina, PR director of New Products Group. – On the one hand, the series is filled with light fun humor, on the other – it encapsulates the winning life philosophy of REVO™: go your own way, laugh at the problems and joke as you overcome obstacles. At the same time, almost everyone is prone to associate themselves with the Cosmonaut, who is comfortable and relaxed in his virtual world, but is shy and confused in real life. And everyone dreams of having a friend like the REVO Can. Thanks to the series, REVO™ began to be perceived not just as a drink, but also as a living character and a friend”.